Get out of jail card. – Dirty wet dog , boats and sailing. This is a quick and dirty post as a kind of bonus blog this week . It’s also a kind of summary of responses to a question i posed to members, here’s what happened. The post got quite a few comments, some agreed with the marina ‘expert’, some said ‘hang on a moment’ and others just thought that the guy was a bit of a blowhard. I made a quick comment at the time along the lines of ‘yes-but-maybe-not always and it’s not the only option. It almost seemed like the kind of post that needed a completely different post in which members could respond more completely and not just with a kind of yes/no answer. I thought about it a while and then posted a return question along the lines of the kind of scenario that yachtmaster instructors and examiners used to like throwing at the prospects…..” so you’re approaching your dock, jetty or marina, or in fact anywhere else and your motor really does pack up….so now what do you do”. I thought that it would be a lot more fun and far more interesting for members to give their own responses and solutions rather than just having to argue the case yes/no to the original post. As to the original post i thought that the fellow who made that remark sounded like a blowhard at the bar or an expert who hasn’t done much sailing or has the worlds easiest berth to get in and out of and always has perfect wind and no tide. In the UK by the way we have a specific meaning for the term ‘expert’ and that is ex and spurt ie a drip under pressure. Something very similar did actually happen to me last year on the last day of sailing ‘Inanda‘ from her home port of Ipswich to my base in the Tamar river above Plymouth. Just as we were about to go through the ‘bridge’ in Plymouth sound with wind and tide dead against us we lost all power. The engine would run in tickover but i couldn’t engage gear or use the throttle. I won’t describe the next few minutes which were a bit ‘sticky’ except that i knew i could drop back on the foul tide and anchor in the deeper water of the sound to the south of the reef and submarine barrier. As it happens i was able to apply an instant bodge with a molegrip on the throttle lever arm and something similar on the gear change once i had cleared the broken cables. In the past i remember having to move a maxi yacht, 80 feet, 38 tons and just 4 crew without a propellor as i remember it and years before that had a total panic moment when the heavy 8 metre cruiser-racer that we were running into a marina lost it’s reverse gear as well…..and that boat really carried it’s way especially with a decent breeze up it’s chuff. 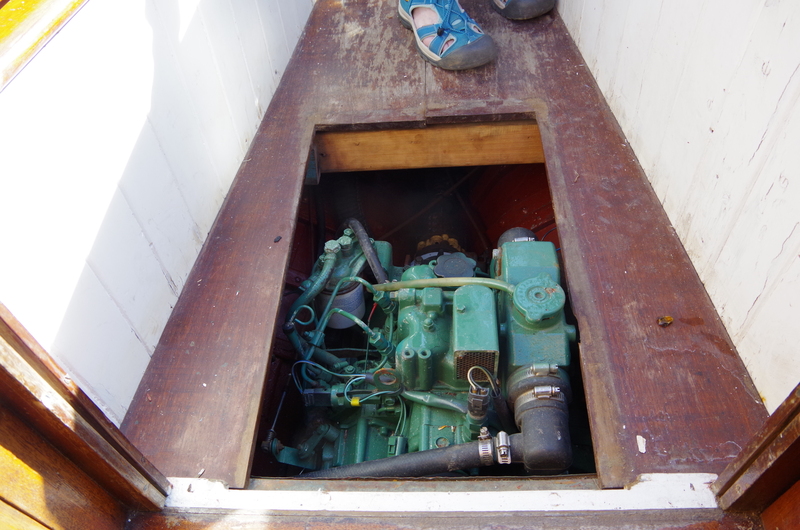 Moving the maxi into a tight marina went well but we had chosen a calm windless morning at slack water to do the job, our method : one dinghy and our best outboard tied at the boat’s quarter as power and the second dinghy at the bow to shove the front around like a bow thruster. The trick was to get enough way on that she had steering and the keel not stall….after that the trick was stopping her and we did that with lines. Anyway this isn’t about my reminiscences from bygone days but a summary of what other skippers and boat owners said about the scenario. Most common….many of the responses involved anchoring the boat and having a think about it before doing anything radical. Many of the same members then suggested calling the marina and asking for a tow in. That will work sometimes if the marina has a workboat and the driver knows what he is about….in my experience that is often not the case. Another variant is to get in really close, as close as the boat’s swinging circle and row a line across to the nearest dock, iv’e seen that done competently, all it takes is a long enough line. Often on a boat that uses a mixed rode the longest one is the anchor warp which is a kind of catch-22 but joining a couple of lines together will do the trick. Along similar lines it is possible to anchor on the bower and then row the kedge or second anchor to a new position and then pull up to the new one. Iv’e never had to do that although it was the answer i gave to a theoretical question during my own yachtmaster exam. Another group of answers said to use the dinghy as a source of power and either towing or pushing the mother boat. In my limited experience with soft inflatables rather than yard workboats (ive’ done plenty of tows with a workboat) the best approach is to lash the dinghy alongside the quarter as it puts the power nearest to where it should be. Iv’e definitely done that one once, can’t remember the when and where except that i put the mate in the dinghy and gave him hand signals for more or less power. Again the trick is to get steerage and right at the end to have as little power as possible such that stopping can be done by hand and line. Less common an answer was applying alternative power on the boat itself. From reading various of the Pardey’s books i know that both the boats they built and sailed were engineless and they routinely used a sculling/sweep oar. It does need a long old sweep and ideally a set-up at the stern to deploy the sweep-oar as a scull. I have sculled a boat but keep forgetting the technique…watching a Breton fisherman doing it nonchalantly with a Gauloise in the corner of his mouth one time was a lesson in skill and efficiency. On my little boat, just over 22 feet and a ton and a half i can move her with a long canoe paddle as long as there is little wind. Couple of years back i paddled WABI”’ most of the way up Ruan creek (River Fal) from the entrance up to where i anchored for the night. Very few members said that they definitely would sail right into a modern marina unless it was just onto say the hammerhead or outer pontoon. Many of the marina’s i know do have an outer berth and on a quiet day enough space to sail a boat up alongside …but many don’t and also, as members say, what wind there is can be broken up and flukey around marinas especially when there are high buildings. One of the worst/most difficult situations would be marina’s like the one in Benodet, south Brittany where the tide sluices diagonally under the pontoons on the ebb and flood….one time i couldn’t even push my little Frances 26 sideways off the pontoon…..coming alongside could have been ….’crunchy’ to say the least. I was thinking about much bigger sailing boats though and ones that didn’t have the luxury of a motor until recent years. The Thames barges are one example, up to 100 tons laden they regularly worked the tidal Thames with just a skipper, a mate and maybe a boy on board. By all accounts a good barge skipper could slide his barge alongside a wharf often with just a scrap of sail….once again though stopping that much mass was the clincher and those old boys knew more about line handling than i ever will. So, what can we take from this ? Well, firstly that members who actually own boats and sail them seem to be a lot more cautious and mindful about the problem. Some would have a shot at sailing in given the right situation, many it seems would rather use an alternative method. Its fun and good practice to actually try to do different things under sail when there’s minimal danger of doing damage. My own practice here, early in the season when there are few boats on the moorings is just to go out and play at picking up a mooring under sail and solo. That kind of play taught me a lot about handling my own little boat and i thoroughly recommend it to others. Anchoring got a lot of mentions, in fact more mentions that anything else. I anchor every time i sail, in fact often several times a day. I will state that i believe it’s essential to have one anchor ready to drop quickly….in less than a minute say. My new technique allows me to throw an anchor off the stern, from the cockpit, within seconds of thinking about it….i’m happy with that although i haven’t ironed out the details yet. I can make a case that a boat should carry 2 anchors at minimum and that one of those would be on a very long warp that can be rowed, walked out, or even swum out……heard of that being done at least once. I also think there is a case for having one ‘long’ line on the boat, here i am thinking that a line of around 50 or 60 metres is really handy. I used to have a 60 metre climbing rope of 8mm diameter that did the job for me…plenty strong enough to haul a boat by hand the same distance or to walk out as a kedge. I for one like hanked on headsails in regard to this kind of problem because i know they can be hoisted and dropped without anyone having to feed the luff. I think that sailing under control slowly is a rarely practiced art especially in tight situations….rivers for example. I’m not always convinced by modern keels and rudders on lightweight canoe body style yachts, even though they shouldn’t stall-out they do seem to. My limited experience with heavier and longer keeled boats suggests that those types can be easier to manage at slow speed but that’s just a personal observation. End of the post then so i’ll link this on the FB page……feel free to comment and keep the conversation going. Next What the sprit did next.